The Sunday Salon [1.15.12] – my books. my life. Happy Sunday everyone. I think I am finally settled into the new year and I can just give you a regular old Sunday Salon today. 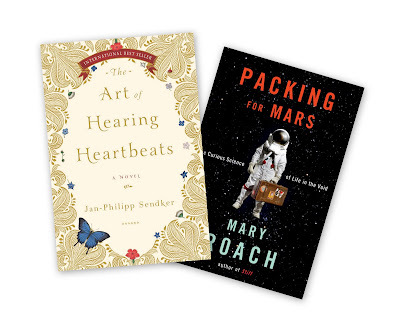 In my book life, I’m back to reading pretty slowly, making my way through The Art of Hearing Heartbeats and listening to Packing for Mars (finally). This week I reviewed The World We Found, Extremely Loud & Incredibly Close, and told you which authors I desperately want another book from. And now I need to get ready for some kids’ birthday parties today. Isn’t it a bit early for this to be starting already? I’m so happy for you! We labored over naming our son, but had no issues with naming our daughter. My husband, God love him, was very good at coming up with the bad nicknames the kids would call our son every time I made a suggestion. Actually, you will be interested to know that we took a weekend vacation to St. Pete Beach to make our final decision! Yay, a boy! I am so excited for you! I also think it can be difficult to choose a boy’s name, but I know that you will find the perfect one before he arrives. I really liked Packing for Mars, and am now listening to Bonk, which is weird, but a lot of fun. I think Packing for Mars was a better book though. Bonk is sometimes a little clinical, which doesn’t bother me, but is less fun. Have a great week with the baby! Second, I have Extremely Loud & Incredibly Close on my TBR pile and while I want to see the upcoming movie, I don’t think it’s going to happen this week because I’m not going to get to it this week. However, I will get to the book this year. Congratulations! We had an abundance of boys’ names; we struggled with girls’ names. Don’t worry about the kids’ parties. You will eventually get to the age where you can drop them off and pick them back up again. It makes all the pain of having to sit through kids’ parties worth it. I love the title of The Art of Hearing Heartbeats. Now I’m curious about it. Finding boys’ names is hard but much easier than looking for girls’ name. Have a great week. A boy’s name came easy for us (Evan) as it fit our four-letter, two syllable requirement. I know… so weird! Plus, he was the only Evan in grade school and if you can believe it, the only Evan in Middle School and he has a large student class. Have fun coming up with a name. I will never forget when I arrived at the hospital and saw the isolette with the name BABY REED and I said, “Oh look, there is another REED in the hospital” and the nurse said… nope, that’s yours. I totally freaked at that moment. LOL.